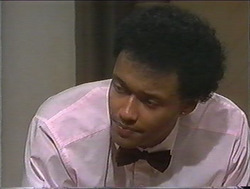 Joe and Clarey come in but Eddie refuses to serve Clarey because he promised he wouldn't drink whilst Dorothy was away. But it's OK because Eddie is only joking – of course he'll serve him! Joe laughs, saying that Clarey would never be able to stop drinking for so long. Clarey challenges Joe, $100 says he can. Des comes in absolutely soaking wet because of the bad weather outside. 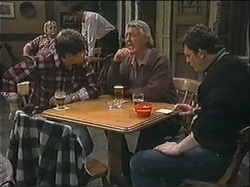 Eddie tells Joe and Clarey their darts opponents and Des wants to join in. Unfortunately, he can't as the heats have already started but Eddie challenges him to a bet. 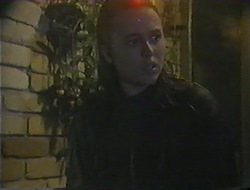 Gemma is walking in the rain, she stops outside number 24 and is indecisive about whether to go in. Harold and Madge are on the sofa, Harold has his head on Madge's lap. He starts talking aobut work and Madge gets a bit annoyed, he apologises. She tickles him and he laughs. Meanwhile, the other side of the front door Gemma hears the laughing and decides not to go in. Gemma knocks on the door and Ryan answers. He gets her some towels and she explains that she got caught in the rain after going to the movies and Harold and Madge are trying to have a quiet night in. Toby comes in with a huge suitcase and Kerry remarks that he's only going for the weekend. Toby explains that there might be floods and he might get stuck. Kerry says if there's not enough room in Danny's car then they might have to take some things out. 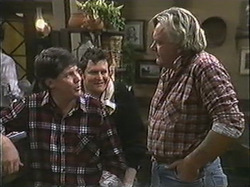 Toby tells Kerry what they have planned for the weekend if it keeps raining and they can't go fishing. One of those things is a darts tournament and Kerry remarks that he's as bad as Joe! Kerry tells Toby to go to bed, but Toby notices that Joe forgot his lucky darts. Kerry agrees that it's odd but if he wanted them that badly he'd have come and got them. Toby reluctantly goes to bed. Joe wins his darts match – but only just. Clarey gets ready for his and “Whacker” walks in (someone Joe knows!). ‘Whacker' is after his money that Joe owes him and isn't happy. Joe explains he's a bit short at the moment but he's going to win the darts tournament and then give ‘Whacker' his money. ‘Whacker' says that, fortunately for Joe, he's in a good mood and he'll give him until Sunday night. Clarey wins his game and Joe remarks that he'll be playing him in the finals at this rate. ‘Whacker' talks to Eddie about betting on the winner. Eddie says Joe's chances aren't good, but Clarey is the one he should go for. Regardless ‘Whacker' goes for Joe - $100 with the odds at 5:1. 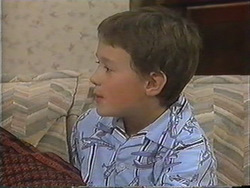 Gemma is talking to Ryan about the places she's lived before staying the Madge and Harold. She admits that she feels like she's in the way there. Ryan hopes she stays in Erinsborough but Gemma's not sure. Ryan says it's fine – he's there to listen to her. Dorothy comes home and can't understand why Gemma is in Dorothy's dressing gown. 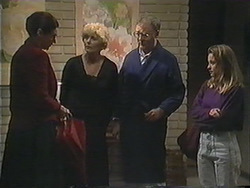 Ryan tries to tell Dorothy and Gemma explains she didn't want to go home early. Dorothy tells Ryan to put on the kettle, her and Gemma need a talk. Eddie calls time and everyone goes home. 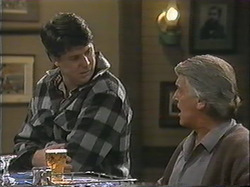 Clarey wants one more drink until he has to give up for the fortnight, Eddie however gives him a take away. ‘Whacker' says goodbye to Joe and tells him not to forget to win. Eddie pulls Joe to the side and asks him about ‘Whacker' and tells him he's bet on Joe and Eddie can't afford for Joe to win because he can't pay him out $500. They try to come up with a plan, Eddie suggests he tries and persuades everyone else to but on someone else and all Joe has t do then, is win. There's a knock on the door and Madge answers. Gemma come sin and Dorothy wants a word with Madge and Harold. HAROLD: Ah, Dorothy. Good evening! Dorothy explains that she came home to find Gemma in her dressing gown waiting for her clothes to dry at theirs because she was too afraid to come home and disrupt Harold and Madge's tête-à-tête. Gemma says she went to the movie son her own and Eddie told her they were having a quiet night – she didn't want to interrupt. Madge puts her arms around her, clearly touched by the thought. Gemma comes through in her dressing gown and they all sit at the table. Madge and Harold ask her why she felt she had to stay out all evening. Gemma is quiet so Madge asks her again, if they don't know what they've done to make her feel like she's not wanted then they can't to sort it out. Madge cuts her off. Gemma says she's caused trouble between Madge and Dorothy, but Madge insists that her and Dorothy have never seen eye-to-eye. Harold apologises if she's been short with Gemma but he's had a lot on his mind with the Coffee Shop. MADGE: Harold! Gemma, he's been going on aobut business all night. If you had come home the only thing you would have interrupted was him droning on and on about the Coffee Shop. They apologise and say they like having her about – a teenager keeps them feeling young. Madge tells Gemma she's wanted and offers her a ‘great big hug'. The two of them hug. Aww. Dorothy is getting ready to go. Her and Clarey aren't exactly seeing eye-to-eye. She tells Ryan that Helen is going to pop in and check up on things whilst she's gone. She tells Clarey to behave himself, and not to harass Helen. Dorothy picks up her bags and says goodbye. CLAREY: Off you go, mount your broomstick. Clarey goes to get some aspirin, presumably for his hangover. Gemma is making breakfast and Madge says she doesn't have to because of last night. Madge then offers to take Gemma shopping, and Gemma says she doesn't have to do it because of last night. Madge says she isn't, she wants to go. Gemma agrees. Eddie calls Harold through. Harold says he only slept a little last night – he couldn't get the Coffee Shop off his mind. Harold says he's come to a conclusion, he can't go into debt at his age. Toby asks Joe if he won his darts, to which Joe says he did. Toby asks about he lucky darts and Joe reckons he could win with knitting needles. Joe goes to put Toby's suitcase in the car and Toby takes Joe's darts with him to Danny's, slipping them into his pocket.